"I was pleading with the soldiers. I was kneeling and begging because I have diabetes," said Helen Cordial, whose house was destroyed in the storm. "Do they want me to die in this airport? They are stone hearted." Most residents spent the night under pouring rain wherever they could -- in the ruins of destroyed houses, in the open along roadsides and shredded trees. Some slept under tents brought in by the government or relief groups. "It's overwhelming," said Air Force Capt. Antonio Tamayo. "We need more medicine. We cannot give anti-tetanus vaccine shots because we have none." International aid groups and militaries are rushing assistance to the region, but little has arrived. Government officials and police and army officers have all been caught up in the disaster themselves, hampering co-ordination. "We have deployed specialist teams, vital logistics support and dispatched critical supplies -- but we have to do more and faster," said UN humanitarian chief Valerie Amos, who was flying to the country. 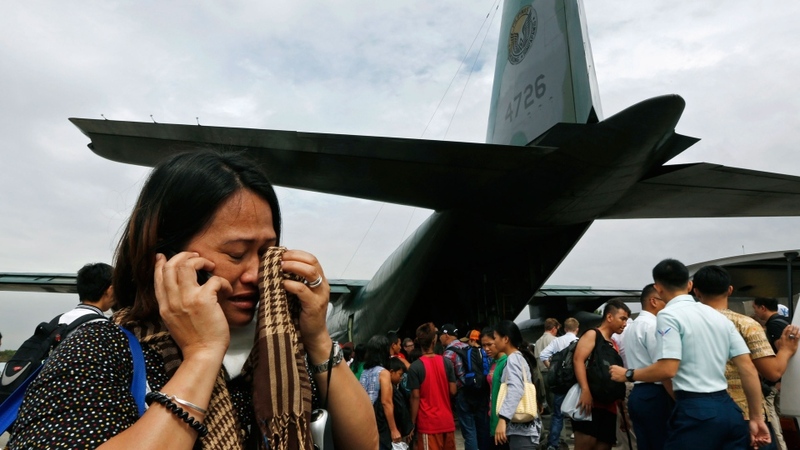 Joselito Caimoy, a 42-year-old truck driver, was one of the lucky ones at Tacloban airport. He was able to get his wife, son and 3-year-old daughter on a flight out. They embraced in a tearful goodbye, but Caimoy stayed behind to guard what's left of his home and property. "There is no water, no food," he said. "People are just scavenging in the streets. People are asking food from relatives, friends. The devastation is too much ... the malls, the grocery stories have all been looted. They're empty. People are hungry. And they (the authorities) cannot control the people." At a small naval base, eight swollen corpses -- including that of a baby -- were submerged in water brought in by the storm. Officers had yet to move them, saying they had no body bags or electricity to preserve them. The official death remained at 942. However, with shattered communications and transportation links, the final count was likely days away, and presidential spokesman Edwin Lacierda said "we pray" it does not surpass 10,000. "I don't believe there is a single structure that is not destroyed or severely damaged in some way -- every single building, every single house," U.S. Marine Brig. Gen. Paul Kennedy said after taking a helicopter flight over Tacloban on Monday. He spoke on the tarmac at the airport, where two Marine C-130 cargo planes were parked, engines running, unloading supplies. "Imagine America, which was prepared and very rich, still had a lot of challenges at the time of Hurricane Katrina, but what we had was three times more than what they received," said Gwendolyn Pang, the group's executive director. 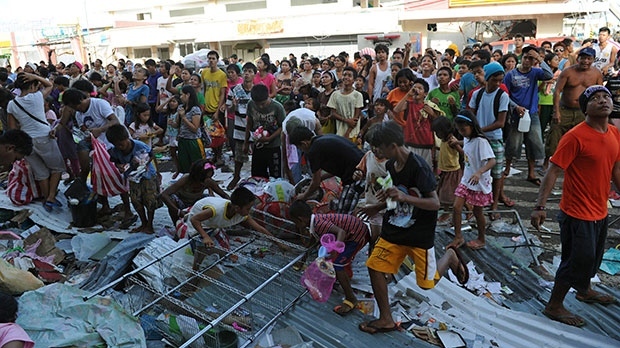 Philippine President Benigno Aquino III declared a "state of national calamity," allowing the central government to release emergency funds quicker and impose price controls on staple goods. He said the two worst-hit provinces, Leyte and Samar, had witnessed "massive destruction and loss of life" but that elsewhere casualties were low. 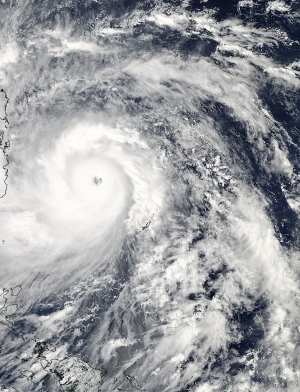 The Philippines, an archipelago nation of more than 7,000 islands, is annually buffeted by tropical storms and typhoons, which are called hurricanes and cyclones elsewhere. The impoverished and densely populated nation of 96 million people is in the northwestern Pacific, right in the path of the world's No. 1 typhoon generator, according to meteorologists. The archipelago's exposed eastern seaboard often bears the brunt. 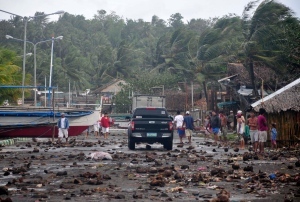 A 1976 magnitude-7.9 earthquake triggered a tsunami in the Moro Gulf in the southern Philippines, killing 4,791 people. 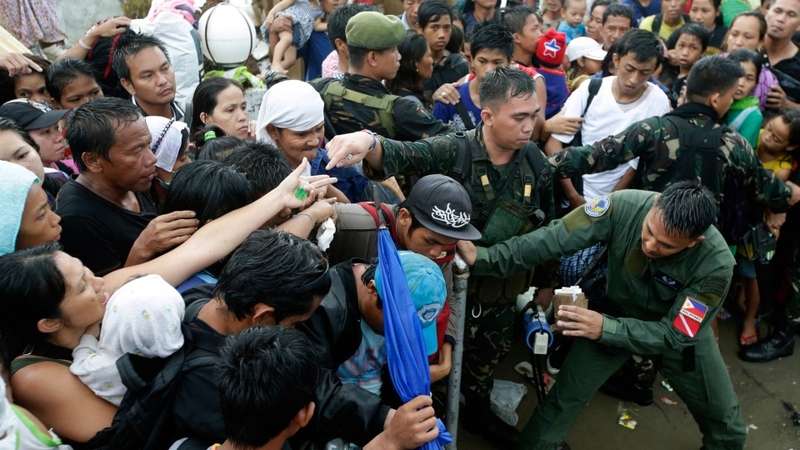 Amos of the UN and Philippines Foreign Secretary Albert del Rosario will launch an emergency appeal Tuesday in Manila for aid to help the almost 9.8 million people affected by the biggest typhoon recorded in almost a century, the director of UN humanitarian operations said. John Ging told a press conference at UN headquarters in New York that an estimated 660,000 people have been displaced and "it's estimated now that over 10,000 people perished." UN agencies and the International Organization for Migration will use the funds to provide emergency food assistance, supply emergency shelter materials and household items, assist with the provision of emergency health services, safe water supplies and sanitation facilities for the most vulnerable. The funding will also be used for critical protection, nutrition and emergency activities, camp co-ordination and management, and logistics to enable a co-ordinated rapid relief response, the UN humanitarian office said. The United Nations will work with the government to co-ordinate the international relief effort, he said. The storm also killed eight people in southern China and inflicted hundreds of millions of dollars in damage to farming and fishing industries, state media reported Tuesday.